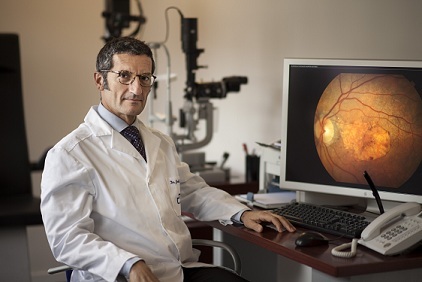 Dr. Jordi Monés, MD, PhD, the Medical Director of the Barcelona Macula Foundation and the ophthalmologist specialising in macula, retina and vitreous at the Institut de la Màcula i de la Retina, has been interviewed by La Vanguardia newspaper. Dr. Monés assessed the clinical trials campaign for Age-Related Macular Degeneration (AMD) conducted by the Foundation and the Institute, which is attached to the Hospital Teknon Quiron. Dr. Monés MD, PhD, expressed optimism about “changing the course of a disease that is a major cause of disability and suffering for the elderly”. AMD, which affects one in four people of over 80, produces a progressive loss of the ability to see images clearly. The Barcelona Macula Foundation and the Institut de la Màcula i de la Retina conduct nine clinical trials; four for the dry variant of the disease and five for the wet type. These trials involve testing new drugs to inhibit the growth of the disease in patients’ eyes. Dr. Monés values clinical trials very highly as many patients regard them as “the only opportunity to gain access to drugs and treatments that are still unavailable”. The results of these trials will begin to be known from 2016. La Vanguardia viewed Dr. Monés and the clinical trials project conducted at the Barcelona Macula Foundation and the Institut de la Màcula i de la Retina as one of the most important in its “Traffic Lights” section and one of the day’s good news stories.